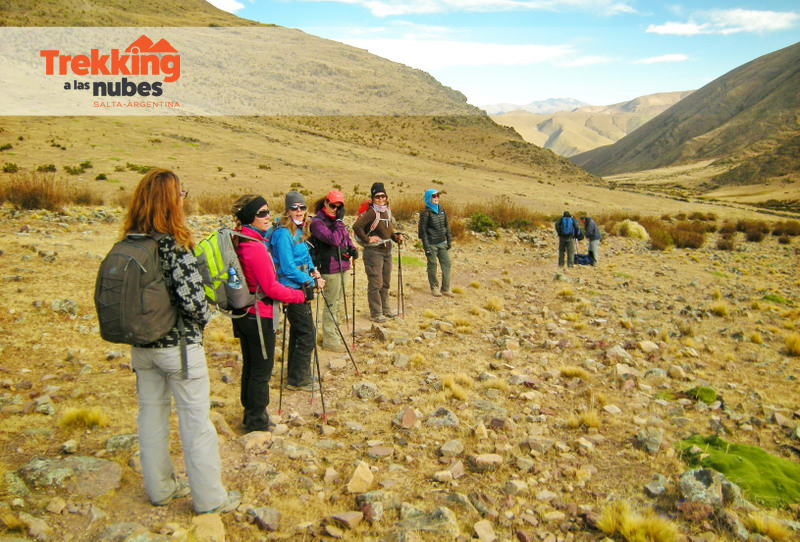 The classic Kallpa trekking adventure in the North-West region of Argentina returns in 2017 and we’re excited to announce the confirmed departure dates. This amazing experience through the clouds comes back in 2017 to keep delighting adventurous travelers from all over the world. 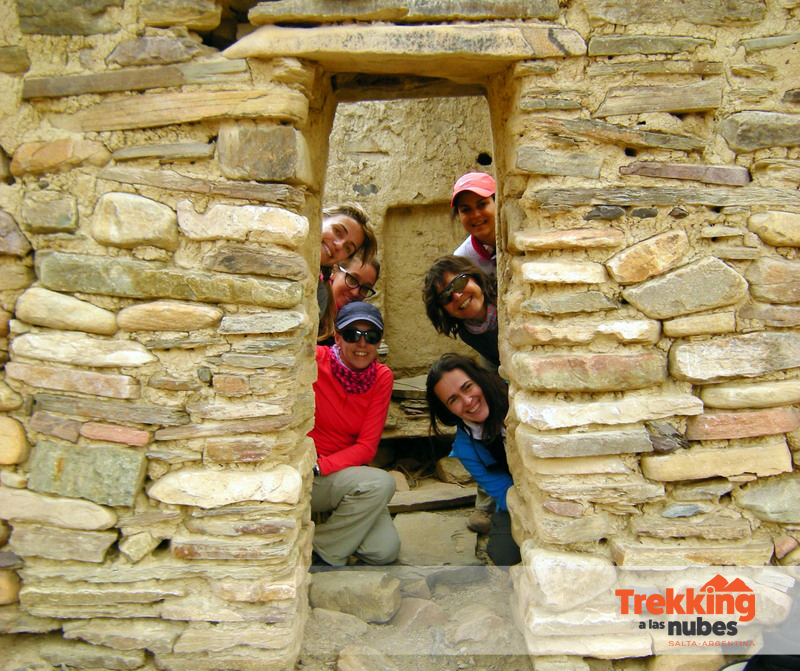 Follow an ancient Inca trail in the mountains and discover ruins, unforgettable views and landscapes but also to enjoy and share moments and meals with local inhabitants. What will make the expedition even more special this year is that the dates were scheduled taking into account some of the Moon phases. 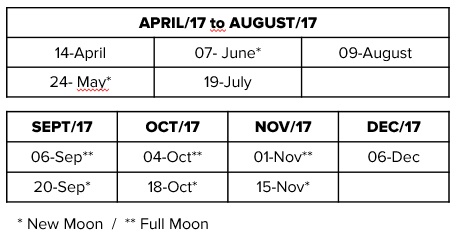 We will have three departures following a Full Moon and five under the New Moon. If weather allows it, this will certainly give an inspiring night time landscape under the moonlight and a view of the sky full of stars. Keep in mind the dates and please contact your Kallpa Account Executive for updated rates, full itinerary and conditions. If you want to get a glimpse of the Trekking to the Clouds route and experience description, don’t miss this article! Also, last year we were glad to have journalist Graeme Green* on one of the Trekking to the Clouds departures and he certainly had a great time. You can read all about his experience on this article published last September in The Guardian. *Graeme Green is a journalist, travel writer and photographer for UK and international publications such as The Sunday Times, National Geographic and The Guardian. Patagonia: one of the most sparsely populated places on planet Earth, surrounded by pristine wilderness and the dramatic scenery of the Patagonian steppe. This Last Frontiers expedition takes you for 8 days to the outmost skirts of this territory, diving into the last less traveled corners in the Argentine and Chilean Patagonia. On the first day of our adventure, we drive north from El Calafate to an authentic estancia, where we will also spend the night. La Angostura is a ranch in the Santa Cruz province that has been runned by the same family since 1916. Nowadays, the grandson of the original owner welcomes and delights tourists with home-made meals and family anecdotes of the estancia. Day 2 of the journey takes us to the Cueva de las Manos (Hands Cave), a UNESCO heritage site and one of the most famous and fascinating displays of drawings and paintings by the primitive inhabitants of these lands, the pretehuelches. These are the first artistic manifestations known from the south-american original cultures and were originated during an extensive period from the 9300s to the 1300s before today. The drawings show different elements related to the daily life of the tehuelches, being the positive and negative spray-painted hands’ silhouettes the most recognized ones. Cueva de las Manos, Santa Cruz. This day ends in Lago Posadas, located north in Santa Cruz province and in the oriental border of the Andes range. From this point, the next day we depart towards Chile. Lago Posadas provides one of the most scenic, hard and off-the-beaten paths in southern Argentina. 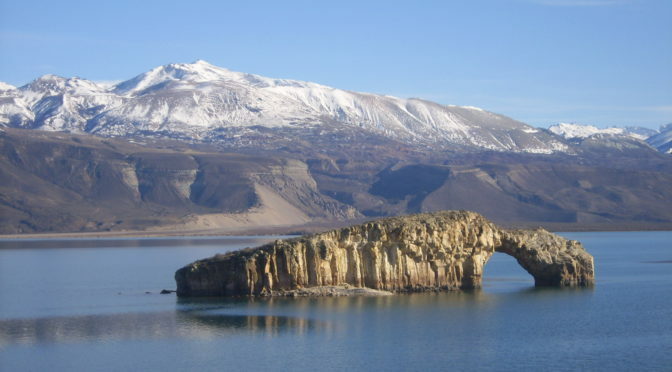 This day’s hike involves walking along basaltic dams and sandstone formations -volcanic remains of the Andes’ origins- with views to one of the highest peaks in the Patagonia: Mt. San Lorenzo. Later this day, we drive through Paso Roballos -an international mountain pass to cross the Argentina/Chile border- and finally arrive in Puerto Bertrand, where we spend the night. The next morning we drive southwest along the Chilean Carretera Austral, next to Baker River. This is a scenic drive into the wilderness of Chile, with views of the mountains and the aquamarine river waters. We finally arrive to the Pacific coast fiords in Caleta Tortel. This unique fishing village doesn’t touch the ground. It is beautifully positioned between two ice fields, in a zone with archipelagos, canals and estuaries, enclosed by steep mountains and right next to Baker River’s mouth. With more than 7 km of walkways, platforms, bridges and stairways made of cypress wood instead of concrete streets, this village was declared landmark due to its architecture and traditional way of life. After spending the night in this magical place, day 5 awaits. 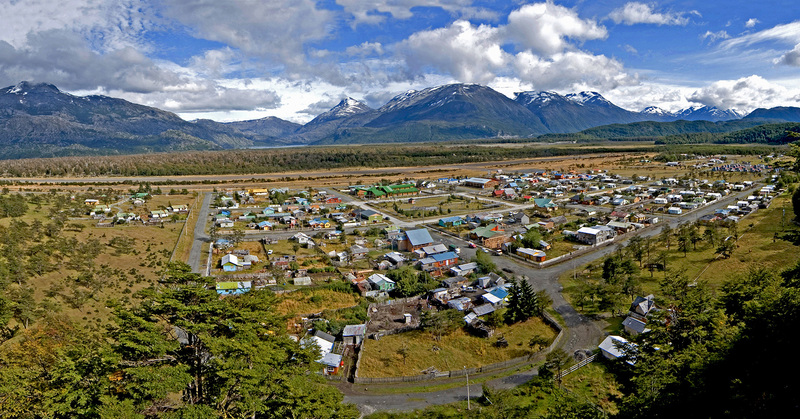 We arrive at the utmost tip of the Carretera Austral in Villa O’Higgins. This village is one of the fastest growing locations in the Carretera. Actually, this is the end of the road and the beginning of a new journey. Near the city, the Mosco River Valley’s hills and wetlands are home to a large colony of huemul, the patagonic deer that is depicted alongside the condor on the Chilean coat of arms. Day 6 brings us the Last Frontier of the trip. We navigate the emerald waters of O’Higgins Lake, along one of its eight arms, arriving lastly in Candelario Mancilla. The nature of this amazing spot, its few inhabitants and vibrant affluence of travelers impresses us. After lunch here, we hike back to Argentina. 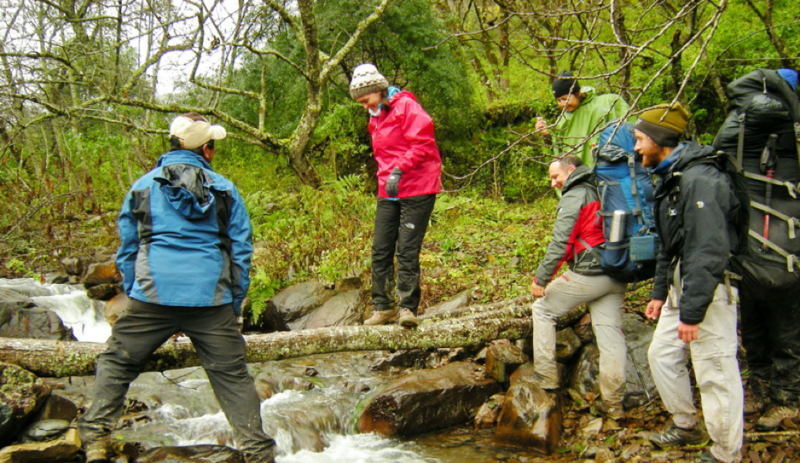 A 3 hour walk in the middle of the forest through Candelario Mancilla and Lago del Desierto takes us to the border again, arriving in El Chaltén, Argentina’s trekking capital and final destination of this exciting journey. Lago del Desierto, El Chaltén, Santa Cruz. The last two days ahead are at your leisure, but if you’re not too tired we highly recommend hiking on your own or with a guide to Laguna de los Tres and face one of the most impressive mountain ranges in America: the Fitz Roy Massif. We also suggest a trek to Laguna Torre, another classic hike in El Chaltén through diverse glacial landscapes, nir and lenga forests and several panoramic mountain views. 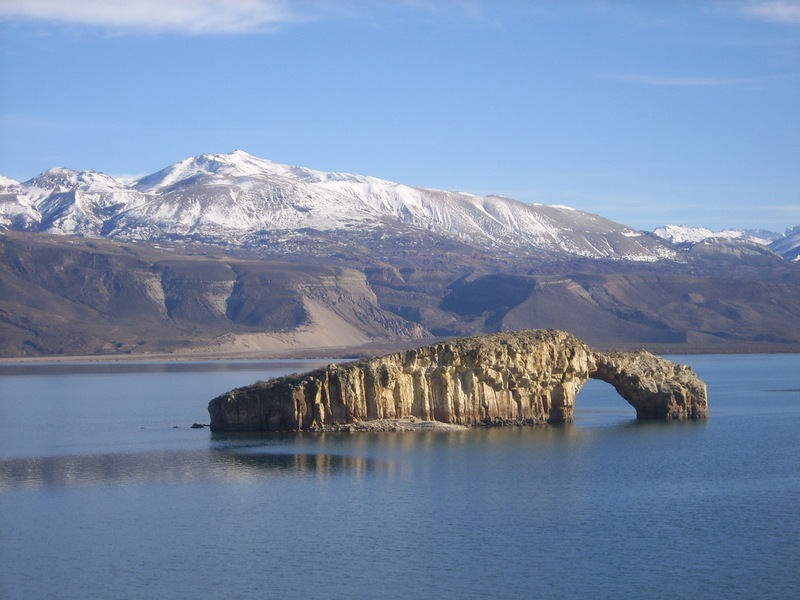 The trip ends with shuttle service to El Calafate town or airport. 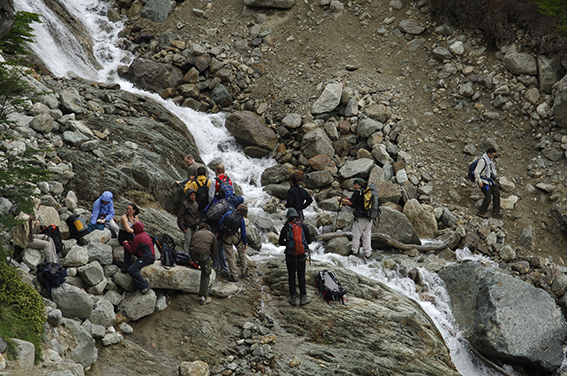 Optional trekking to Laguna Torre. El Chaltén, Santa Cruz. As you know by now, this amazing expedition provides a unique and adventurous experience across unfrequented paths enriched by the beautiful scenery and wilderness of the Last Frontiers of the Patagonian steppe. A perfect journey for nature and hiking fans. 7 nights of accommodation in economic hotels in standard rooms, including breakfast. Entrance fee to Cueva de Las Manos. Excursions and services as described in the itinerary. Fees and expenses for the TG. Meals, drinks, excursions and services not mentioned in itinerary. Read more about our Andean Experience Buenos Aires to La Puna. One of the most interesting fixed departures of Kallpa. Our experience starts in Buenos Aires, one of the more cosmopolitan cities of South America which holds a great cultural and architectural richness. Wandering around its streets in the City Tour we find a landscape marked by the history, good cuisine and culture. After our first night in Buenos Aires, we left early towards the city of Salta. When we arrive there the local guide, who was waiting for us, takes us to the hotel and explains to us in more detail the important aspects of the trip we are about to start. During the afternoon we had a City Walk through Salta that was founded in 1582 and, that currently continues having a marked and distinguished Hispanic character that distinguishes the other Argentinian cities. During the tour we walked up to 9 de Julio square where we observed the most important buildings: the Cathedral, the Cabildo, the Church of San Francisco, San Bernardo Convent -the oldest one of the city. Then we took the Cable Railway of San Bernardo Hill from where we had an incredible panoramic view of the City. We spent an excellent free day in Salta, visiting “peñas” (folk club), testing the well-known “salteñas empanadas” (pasty meat-filled) and having different encounters with the local culture. 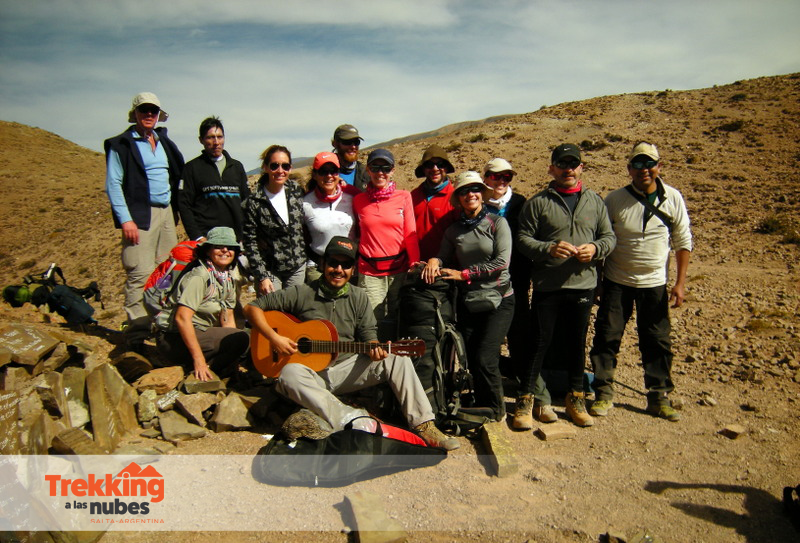 Some other people chose to discover the charms of Cafayate or Cachi in the Calchaquíes valleys. 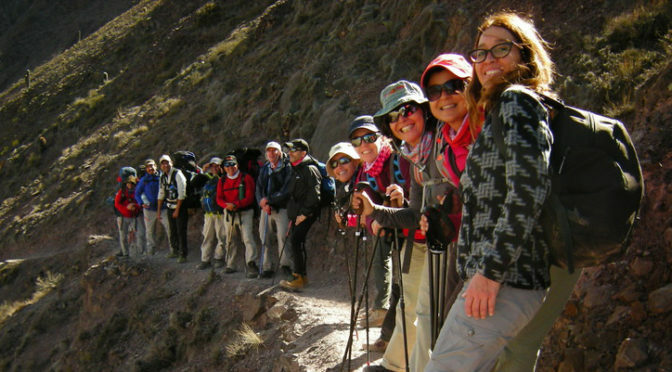 Afterwards, our trip to the “Quebrada de Humahuaca” (ravine) started going through different towns during the trip such as Purmamarca, there we appreciated its famous Seven Colored Hill and visited the craft stalls arranged in its principal square. In Maimará, we took pictures in the Painter’s palette picture frame. Its colorful cemetery -this region’s peculiar characteristics- was also a bedazzling experience. At Tilcara we encountered the Pucará ruins -some amazing rebuilt indigenous ruins- and the archeological museum. After visiting Huacalera and Uquía, we reached Humahuaca, where we went trekking together with our guide to discover some picturesque corners. The fifth day of our journey took us to La Quiaca, located on the north of the province of Jujuy, which functions as a crossing border to Villazón (Bolivia). From there we took the train to Uyuni and we said goodbye to the Argentinian guide. Upon arrival to Uyuni, we met our local guide who will be with us in this part of the trip. On the morning of the sixth day, after breakfast the journey to Colchani started. There we are going to see the local settlers in the salt production process and we are going to penetrate the immense “Salar de Uyuni” (salt mine) up to the Incahuasi Island. Such journey took us approximately 2 hours and we appreciated the presence of volcanic rocks and an enormous cactus. 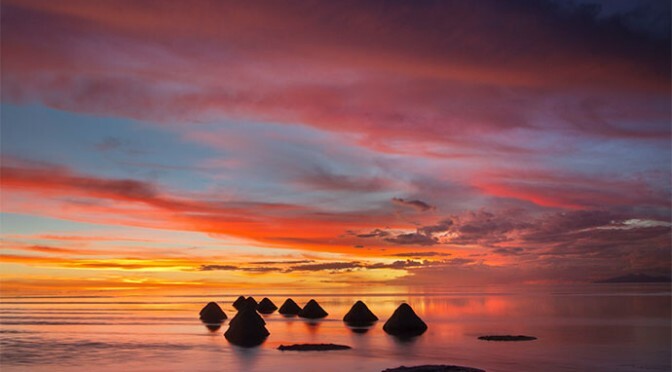 Afterwards, our trip continued towards the North to see the mummies of Coquesa and then to east, approximately 2 hours, to visit Tahua, a village in the coasts of the salt evaporation ponds and on the base of Tunupa Volcano. There is one more night at Uyuni in our trip and very early in the morning we leave heading south through the salt ponds, leaving Chuvica behind entering the highlands and the ramifications of the occidental mountain range going through the villages of San Juan and San Agustín until reaching the valley of Alota in a 5-hour journey. To the south, large rock formations produced by the erosion are observed. Finally, we arrived to Villamar for spending the night. This trip is the tiring, but very satisfying, type, the diversity of landscapes and natural wonders motivates us everyday to continue travelling and discovering. This morning we are awaken very early for the journey to the Eduardo Avaroa reservation where we visit the Laguna Colorada (Red Lagoon), which has entered on the list of wetlands of international importance and which has been declared a Ramsar site. Later we visited the Morning Sun Geysers, the Chalviri Lagoon and its natural hot springs of Polques. After a three-hour trip we reached the Laguna Verde (Green Lagoon) that is located at the bottom of the Licancabur Volcano. Our trip continues to the border of Chile, “Hito Cajón” (Milestone) where we changed car to further continue to “San Pedro de Atacama” together with our driver. For the next two days, we stayed at San Pedro de Atacama and visited the “Valle de la Luna” (Moon Valley) -one of the most amazing phenomena of the desert of Atacama- because of the incredible forms the landscape shows due to erosion and the climate effects throughout thousands of years. On our free day at San Pedro de Atacama, some people opted for visiting the Tatio Geysers and other opted for discovering Atacama’s Salt Pan. The trip ended at San Pedro de Atacama. Some people decided to continue its journey to Calama and to connect to Santiago or other destinations in Chile. Some others returned by bus to Salta and to follow to other destinations such as Iguazú or Mendoza. On this trip we had the opportunity of visiting natural places, meeting people and taking with us memories of one of the most incredible trips due to the diversity of the landscapes, the warmth of its people and the immersion in the Andean culture that this trip has to offer. Transfers & excursions as detailed in the programme. English speaking local guides (except services that are mentioned unescorted in the program) from Day 1 to day 10. Public bus tickets and train ticket where mentioned. Entrance fee to Moon Valley. 10 Nights accommodation in tourist-class hotels, hosterias, or mountain lodges, in double twin basis with private WC/ shower. Likely hotels are good 3-star middle-range hotels and/ or hosterias. Drinks and meals not specified. Departure once a week, every Saturday (day 1 of the program from Buenos Aires). It is not convenient to carry a lot of money in traveler’s checks. They are usually not accepted at shops in Argentina & Bolivia. US Dollars are accepted readily and credit cards such as VISA, MASTERCAD and AMERICAN EXPRESS can be used in larger cities. The climate varies substantially, from 25 °C or more during the day to near 0 °C or less at night. Excursions are subject to weather conditions. Water-bottle, 3 to 4 cotton sleeved shirts, heavy wool socks, light socks, sunscreen, rain and wind-proof jacket, rain trousers, wool cap, rucksack, polar-fleeces, jeans, t-shirts, shorts, swimsuit, trekking shoes. No sleeping bag needed. Roads: Some sections of the trip can take place in off-road conditions.